Errm.... Am I missing something? Is that too much work? Do you want an app to do that for you? Or do you have existing documents with a full-stop/period + single-space pattern you need to now put double spaces into?? Well, I've single spaced after a period for my entire life, so it's as natural as breathing. If you had to take 2 breaths for every one, it'd be a tad laboring, no? lol. But yes, currently I have written a document with single space after a punctuation that I would like to know if I can add 2 spaces there instead. Does the regex "[a-zäöüß0-9]\. " (the last character is a space) that would implement an enhanced variant of what David suggested for a German writer, e.g., cover what you wanted to replace by one found character followed by a full stop and TWO spaces? This could easily be done by 'Find & Replace'. But you might find some replacements that weren't actually in your mind because this "end of a sentence" pattern may occur in other places, too. Thanks for the answer David, I really appreciate it! I fully understand the problem because I had it too. Not only could I not enter 2 spaces after the end of a sentence I couldn't enter 2 or more spaces consecutively for any reason. Spaces can be added manually by entering Alt + 0160. You can enter as many as you want. It is a bit awkward but it does work. @srice : The character you enter this way is U+00A0 (xA0 = 160) which is a non-breaking space. You may more easily enter it in LibreOffice Writer by Ctrl+Shift+Space. I do not think, however, this was what @shrankaplooza looked for. Make a copy of your document; work on the copy. If this mangles things, there's no harm done; you still have your original. 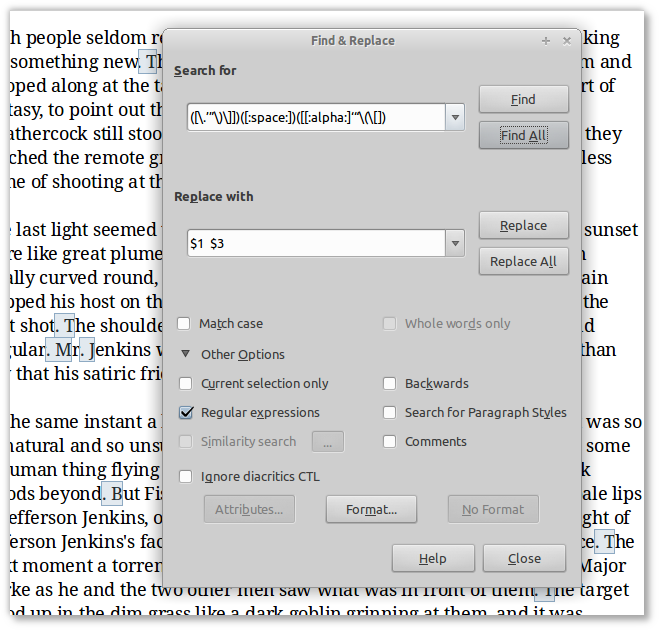 Hit CTRL+H to bring up the search replace dialog. Click the "Other Options" toggle to reveal the "Regular expressions" check box - make sure it is checked. ...and if you're satisfied, click "Replace all". You probably will need now to search for those predictable cases where you want to reduce a double-space to a singe-space. Search = ([\?\. !’”\)\]]) = 1. find all period, question mark, exclamation mark, close quotes, brackets, etc | that are followed by ([:space:]) = 2. a single space | that are followed by ([[:alpha:]‘“\(\) = 3. any alpha-character or open quotes, brackets, etc. You'll want double-space after question marks and exclamation marks too, and the search string caters for this (that's the \?\.! bit in the first part of the search string). You may want to remove the close-brackets in the first part of the search string as it would find (really) things like that -- i.e., the space between really) and things. In the screenshot, the single space between "Mr." and "Jenkins" will get doubled. Nothing you can do about that, but you'll be able to spot fairly quickly these sorts of "false positives" that will need to be fixed. This search excludes hits like Dec. 25, since the string following the dot-space combo must be an alpha or appropriate punctuation.